Miners in a tunnel (file photo). The northeastern corner of the Democratic Republic of the Congo (DRC) is home to some of Africa's richest goldfields. From 1998 to 2003, the mineral helped fuel the deadliest conflict in the history of the continent. Today, armed groups, from government forces to rebel militia, continue to benefit from illicit trade in gold, finds a new United Nations report. Two of the experts working on the UN report were kidnapped and killed in March 2017 while carrying out field work in DRC, highlighting the widespread crisis facing the country. The report by the group of experts on the Democratic Republic of the Congo also finds that a high-ranking Congolese army commander, Major General Gabriel Amisi Kumba, is running a gold mining operation. According to the report, mine workers and agents said Amisi owned dredges through a local company that is extracting gold from the Awimi River in the country's northeastern Tshopo province. DRC's mining code forbids senior military personnel from owning mining rights. The UN report also found that management of the company, which is allegedly owned by Amisi, were being protected by Congolese army forces (FARDC). Amisi is currently the government army commander of the First Defence Zone, which covers the capital, Kinshasa, and other western provinces. He has long been accused of serious human rights abuses, including widespread killings as well as arms trafficking and the smuggling of minerals, including gold. As early as 2002, Human Rights Watch implicated Amisi in massacres in Kisangani, the capital of Tshopo province. He was suspended from the army in 2012 after a previous UN report accused him of overseeing a network distributing weapons to poachers and armed groups. (He was reinstated in 2014 after Congolese authorities cleared him of charges). In late 2016, both the European Union and the United States imposed a travel ban on Amisi and the freezing of his foreign assets. The findings of this latest UN report into DRC come as no surprise to Claude Kabemba, director of Southern Africa Resource Watch, which monitors the extractive industries in southern Africa. "In Congo, everyone is in the gold business: generals, ministers, even simple soldiers," Kabemba told DW. "It's no secret." Decades of corruption and 20 years of conflict have left the country devoid of a functional government and institutions. With extractives the only sector in the country turning a good profit, said Kabemba, "every one wants to be involved." "These problems have been known for years, even the Congolese army has held internal investigations," said Radley, who regularly travels to the country's eastern provinces to research mining there. The Belgian research group IPIS found an armed presence at the majority of artisanal gold mines they visited in 2015. These armed groups included the state FARDC army as well as other militias. One reason for gold's attraction is that it is more difficult to regulate and track than other minerals, Radley told DW. "You would have to smuggle a ton of minerals such as tin or cobalt, [which are also mined in DRC], to turn a profit," Radley explained. "But you can just put a kilo of gold worth several thousand euros in your pockets and smuggle it across the border." The main buyers of this illegally exported gold are the United Arab Emirates, India and Lebanon, says Claude Kabemeba, where no one is interested in where the gold comes from. 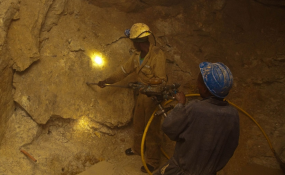 According to the UN report, nearly all of DRC's artisanally sourced gold (gold mined on a small scale often in an informal manner) was illegally exported in 2013. Although it's difficult to know how much artisanal gold is smuggled out of the country each year, estimates range from $300 million (252 million euro) to $600 million. The illegal exports not only deprive the government of vital tax income, they also feed corruption and line the pockets of armed groups. The international community has been trying to certify and track so-called conflict minerals - with limited success. "External pressure is there but the responsibility lies with the Congolese state," stressed Claude Kabemba. "We need a new generation of politicians who work for the people instead of robbing them," he said. His organization recommends that provincial governments buy gold directly from artisanal mine workers at a fair price. In addition, he said, DRC needs to lower its gold export tax to the same level as neighboring countries, which would reduce the incentive to smuggle gold across the border. Having well trained police and border guards would also help, he said.